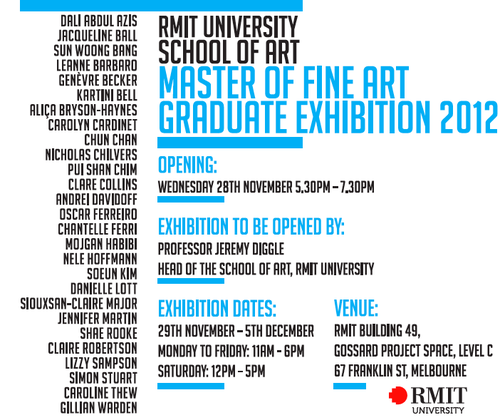 The RMIT Master of Fine Arts Graduate Exhibition 2012 opens this Wednesday 28 November from 5:30 - 7:30 pm at the Gossard Project Space in RMIT Building 49, Level C, 67 Franklin Street, Melbourne. The exhibition will showcase graduating MFA candidate work from all disciplines. 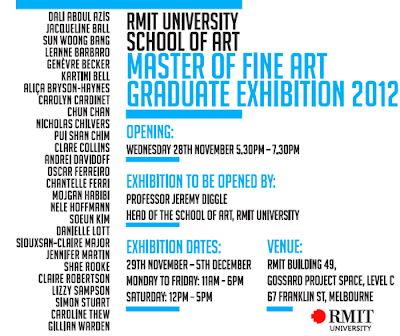 Graduating gold & silversmithing candidates include Jennifer Martin, Sun Woong Bang and Danielle Lott. The exhibition runs from 29 November - 5 December. Congratulations to the graduating MFA candidates! Happy Thanksgiving: I'm thankful for TAFE!